Figurative speech is the language we use to spice up our writing. Besides their aesthetic value , figurative expressions and axioms cast a flavour of 'writerly professionalism' on the written piece. It does take so much practice for students to be adept at the use of figurative language and there are no shortcuts to learn that quickly. There are however some useful tips to help them in their learning process. 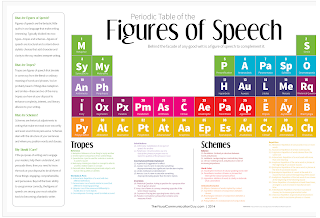 Periodic table of the figures of speech is an example of a very good document students can draw on to consolidate and learn different ways to use figures of speech. Periodic table of the figures of speech,which I discovered through a post by Lifehacker, is a work realized by designer Curtis Newbold. The visual features two main genres of figures of speech namely: tropes and schemes. Tropes cover expressions like personification, metaphor, irony, hyperbole..etc and schemes cover things like ellipsis, alliteration, parenthesis..etc. Curtis provides ample explanation of each of these genres and also offers some useful tips on how to use each of them. 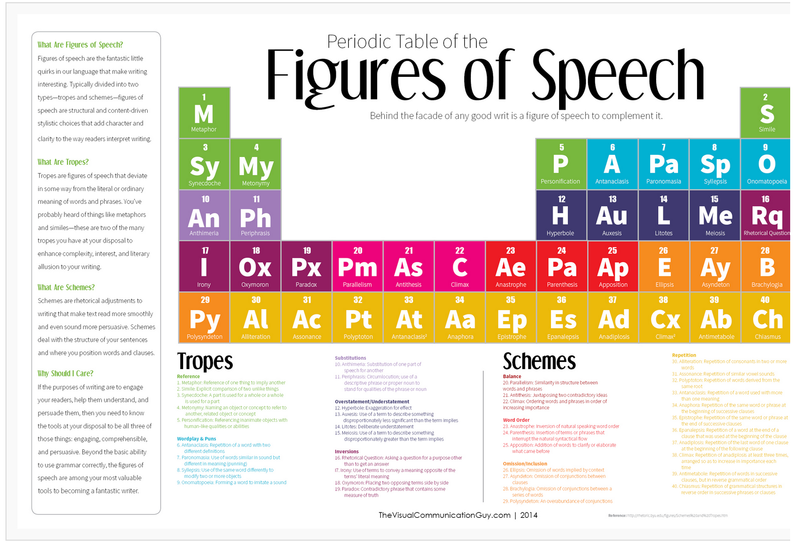 This full-size graphic of Periodic table of the figures of speech is available from this link.